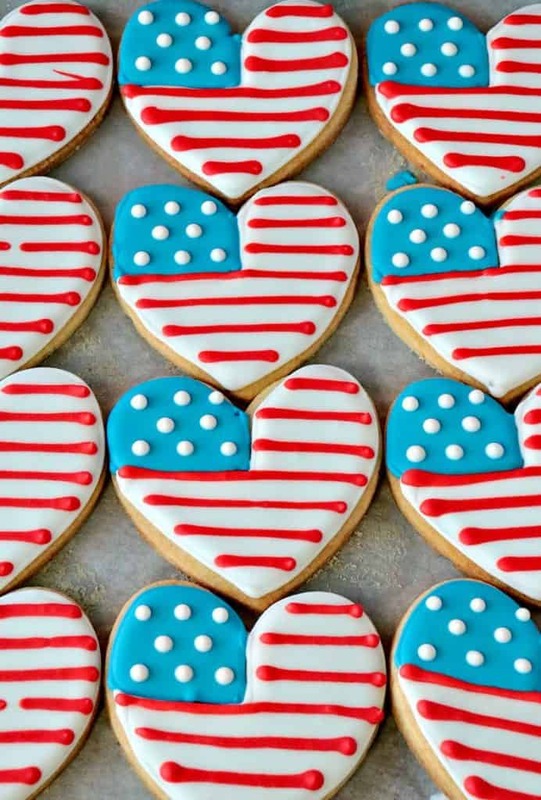 While these adorable red, white, and blue Americana cookies do take a bit of time to prepare and decorate, American Flag Heart Decorated Sugar Cookies are definitely worth the effort! They’re sure to be a hit at your next patriotic party or event. Now I only bake and decorate sugar cookies when I’m really in the mood, and when there is a special occasion. For me, Memorial Day and the 4th of July are just the types of special occasions which call for patriotic cookies. 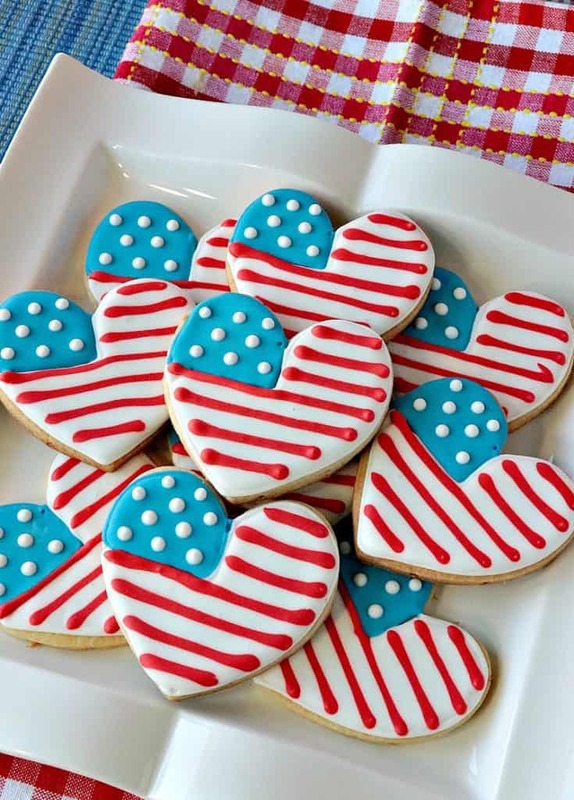 Especially when they’re these fun American Flag Heart Decorated Sugar Cookies. 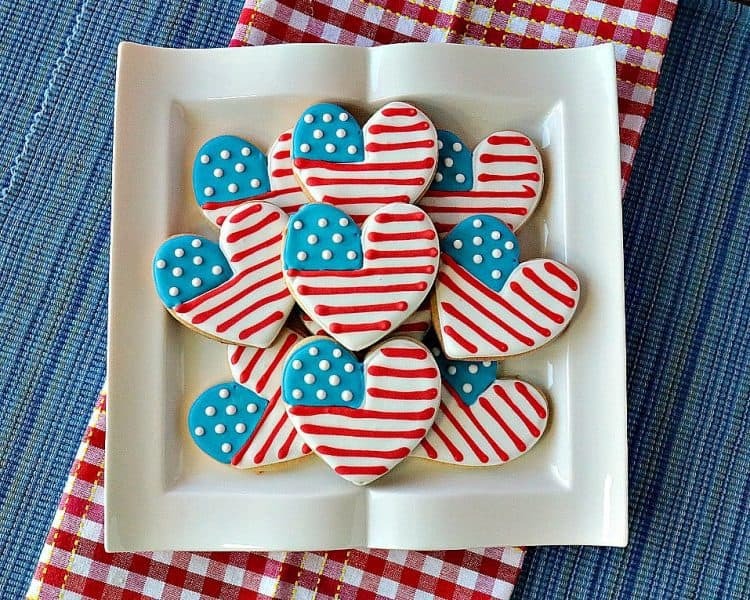 The recipe I used for these American Flag Heart Decorated Sugar Cookies is the same recipe I used when I ran my cookie business. In my honest opinion, it’s simply the best sugar cookie recipe around because it’s simply delicious, and because the dough holds its shape during baking which is so very important! To find my Kudos Kookies Sugar Cookie Dough Recipe, please click HERE. 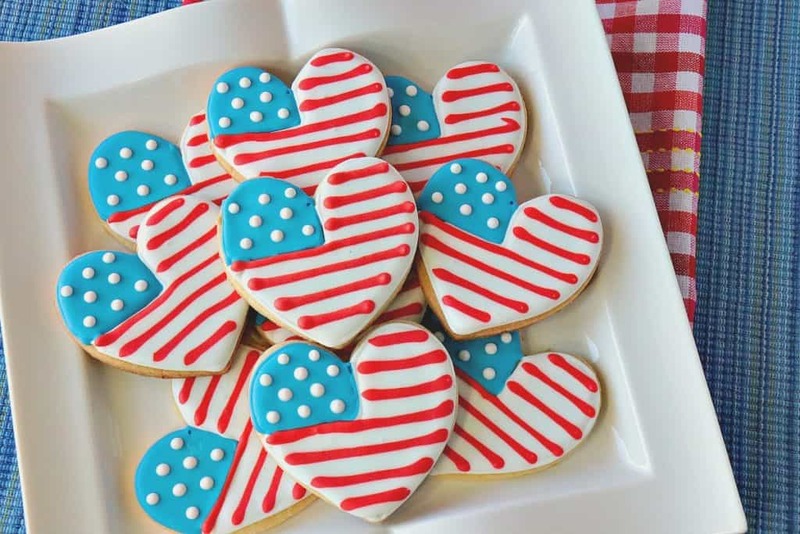 **Please Note – The printable recipe card with detailed instructions and complete ingredient measurements for making American Flag Heart Decorated Sugar Cookies is available near the end of this post. 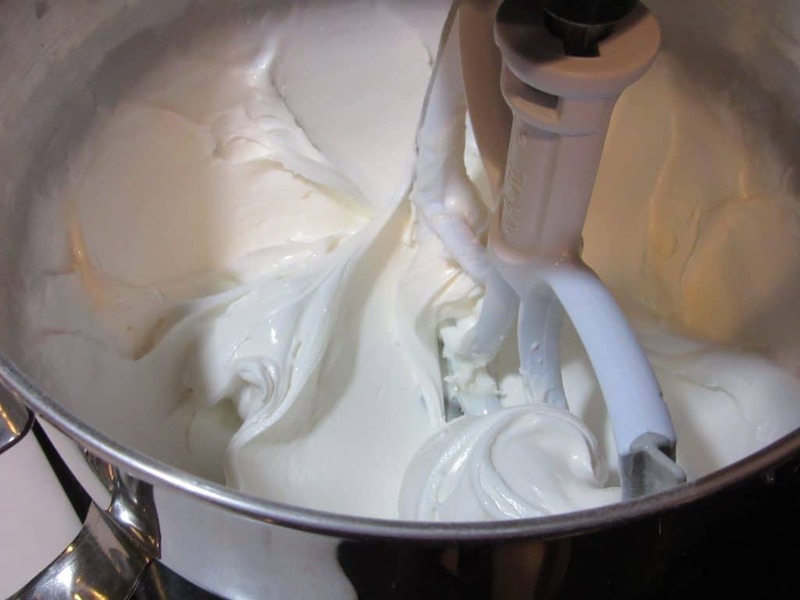 To make the royal icing, place 4 cups of confectioners sugar into a large bowl along with ¼ cup meringue powder. 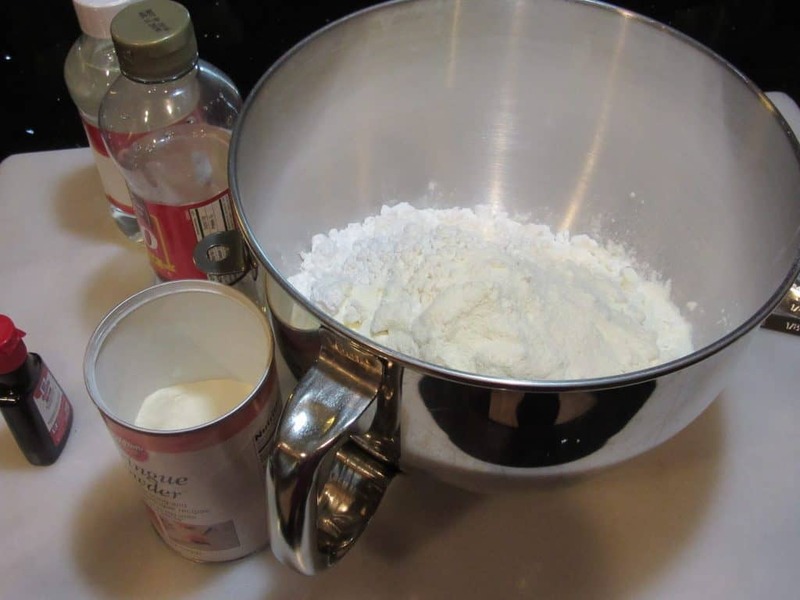 Add 1 teaspoon pure almond extract, 2 tablespoons corn syrup, and warm water (start with 2-3 tablespoons, adding more as needed) until you achieve your desired consistency. **NOTE – For a thicker, outline icing, start by adding a little water. To make a thinner, flooding icing, use more water a little at a time until you reach your desired consistency. 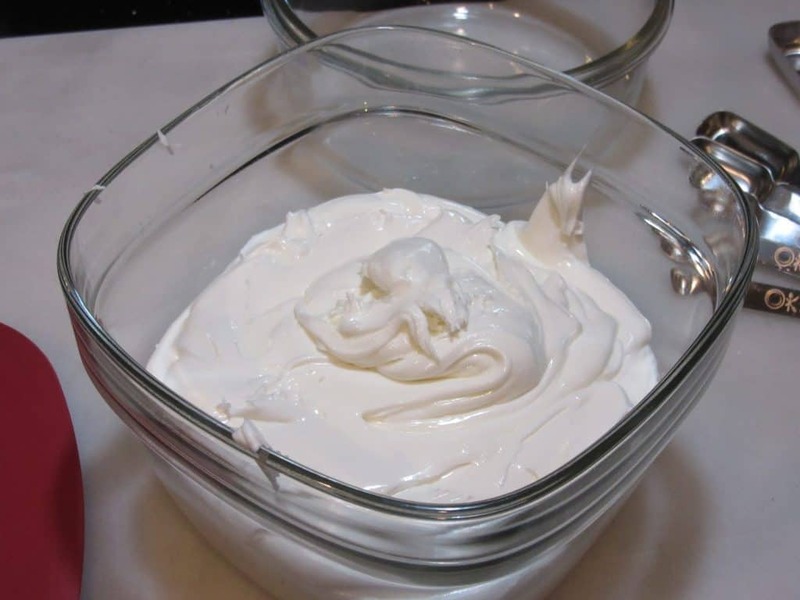 To store, add the royal icing to a bowl or jar with a tight-fitting lid. No need to refrigerate. When you’re ready to add color, spoon a selected amount of white royal icing to a bowl or dish, add the gel color along with a bit of water and stir well until the color is uniform. You’ll notice in the video below I used a parchment triangle to make my piping bag because that’s the way I learned how to do it. However, you can also use a zip-top plastic bags and snip the corner of each bag (small holes for thin lines and larger holes for thicker lines) for the same effect. OR if you happen to have piping bags with decorating tips, by all means, use them. 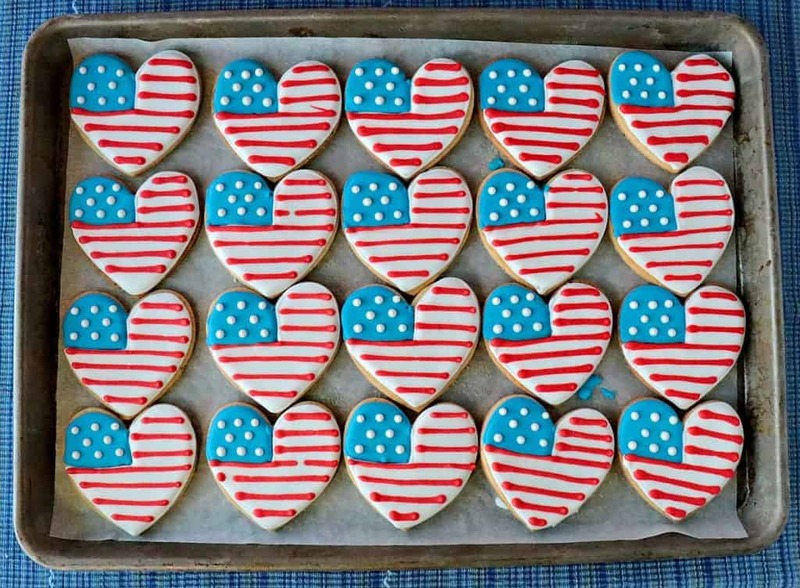 I did my best to produce the below fast-paced video of the making of American Flag Heart Decorated Sugar Cookies. I hope you’ll find it entertaining and helpful. If you enjoy this video, please don’t forget to subscribe to my Kudos Kitchen channel on YouTube. Thanks so much!! This royal icing is not too sweet with a light almond flavor. Once dry, it doesn't become rock hard which makes it perfect for cookie decorating. Add the sugar, meringue powder, corn syrup and almond extract into a large bowl. Slowly add warm water to the sugar mixture and blend on low speed until you've reached your desired consistency. Adding more water will make it thinner and less water will keep it thicker. 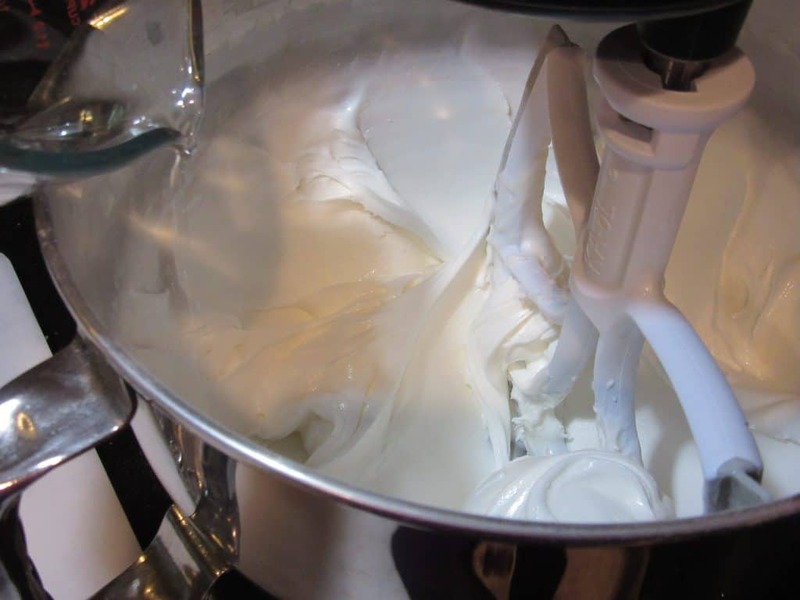 Place the royal icing in an airtight container with a tight-fitting lid. No need to refrigerate. stand mixer or hand mixer, large bowl, measuring cups, measuring spoons, many smaller bowls for mixing colors, gel food color, spoons, parchment triangles, ziptop bags, or piping bags, large bowl with tight-fitting lid (for storage), parchment paper and baking sheets, small squeeze bottle (optional) for adding water to the icing. For the outlining and details, a thicker consistency icing is required. For flooding, a thinner consistency icing is required. I always like to keep a thicker AND thinner icing (in premixed colors) handy. Then, as needed I can thin the thicker icing should I need additional flooding icing. Reminder; For the printable Kudos Kookie sugar cookie recipe I’ve been using for years and years, please click HERE. 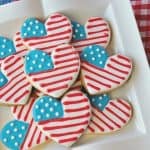 I sincerely hope you’ve enjoyed today’s recipe and video instructions for making these Patriotic American Flag Heart Decorated Sugar Cookies as much as I’ve enjoyed bringing them to you! I love how festive these look! You’re a great cookie decorator! Thank you. I used to have a cookie business. I love these they are so cute and so perfect for summer! Awesome icing job!